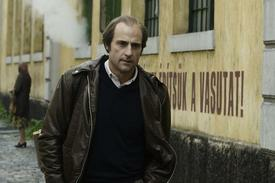 Mark Strong has a history of playing tough bad guys and sociopaths. But in Tinker, Tailor, Soldier, Spy Strong plays someone who's only a bad guy to the Russians: Jim Prideaux, an emotionally broken spy, who gets sold out by double agents in the very system he fought to protect. Boxoffice asks the London-born Strong about growing up in Cold War Britain and learning how to bottle up your feelings like an old English man. One thing that struck me in the film was the different way that British people spoke, and even moved, at that time. How did you research how to talk, and walk, like a British man in the '70s? Well, Britain was—and still is—riddled with unequal class structure, and these characters were all from an upper crust, private school background. They all spoke and moved in a particular way. If you're a British kid and you're interested in spying, you're going to come across le Carré, as I did in my late teens. So you have an idea of how those guys operate: they're an old school, old club network. But the truth is you can never just play a period. You have to remember that they wore this stuff everyday in their lives. When I was in that Jane Austen movie Emma, I had to wear high collars and stiff outfits, but that's what those people wore everyday. You couldn't walk around in it like it was exotic. I couldn't walk around in Jim Prideaux's skin as though he was exotic. He was just a product of the system that he came through. The spying game in Britain seemed like an old boys club. Did you have to meet up with older British men to see how they acted? You ever meet a spy? It's obviously very difficult, because spies are well known for not being forthcoming, you know. You couldn't really just turn around and say, "Hey you look like a spy, tell me all about it." But there's a kind of understanding because of Kim Philby, Guy Burgess and Donald Duart Maclean—British spies who gave information to Russia as double agents—that this is part of our history. It was part of our history. In the Cold War, we knew that we were at war with Russia in a very secret way. It's a part of our history, so it didn't really require a lot of research, because it's part of us. And men of this era were closed off; they didn't have the psychological capabilities to communicate in ways that evolved with drugs and music in the later '70s. You just didn't talk about your feelings. British men at that time were taught not to access feelings at all, but to put their heads down and move on. It was all about forging ahead for the Empire and not letting any personal feelings get in the way. We were taught to subsume feelings for the greater good. And spies were just cogs in this larger machine—they had to sacrifice everything for the country. My character, Jim Prideaux, was chewed up and spat out by the machine. I think that's why you could feel sympathy for him. He's the one who came squirting out the other end. He realized what a terrible machine it was. How faithful is the movie to your own experience of growing up in Cold War England? Tomas [Alfredson] created it brilliantly. It was this tobacco-stained, analog world. Brown and bottle greens were fashionable colors. Everyone was experimenting with fondues. It was an odd time. As a young man in the '70s, I was very conscious of the anti-nuclear campaigns and the Green movements. There were a bunch of women who camped outside an American Air Force base saying that American missiles shouldn't be on our territory. So politically we were aware of how height the stakes were, in the case of proliferation of nuclear arms and the mistrust of all the governments had against one another. We were aware of this maligned, dark influence in society, which I think punk was a complete "F--k you" to all that strangeness and paranoia of kids who grew up then. They said, "We reject your society completely," and "We embrace nihilism because that's all that you left us." There was that generational divide. Did you experience that divide of the old white guys that ran things? Pretty much until rock and roll, people pretty much dressed like their parents. It wasn't until the '60s that people dressed differently from their parents. So with the '70s right after that, you get the sense that those old people were dinosaurs compared to what was going on around them. People were turning on, tuning in, and dropping out. They were still locked in this old established thing. Exactly, the decline of the Empire, and spies still there, thinking that they were at the forefront of it, but really England was playing second fiddle to the Americans. And the Americans represented a new order, the post-colonial world, which caused the British spy agency to hold them with such disdain. Completely, because at that time the British had lost the power and America had gained it. And now that the American dynasty, or Empire, could be possibly be coming to an end now, it plays as an interesting subtext in the film. Global power can wane. We saw the breakdown of this old school establishment with the Philby, Burgess and Maclean affair, where we realized that some of those in the establishment weren't who we thought they were. Things that are secret are always interesting, and Le Carré knew that world. All you knew was that people were building up weapons, and that there were Russian submarines off the Scottish coast. There was this idea that there was an unseen enemy. The film taps into that unspoken idea that behind spying was predicated on the idea that one side will cause the destruction of a country, or even the world. The ultimate irony is that it was all played like this board game with each other—they took it so lightly.